Discovery Passage and Quadra Is. Some very popular boating areas in British Columbia are the Gulf Islands. The islands are protected from the winds and rains of the west coast and marine life is abundant. During the summer, you might see killer whales, seal lions, harbour seals and porpoises. Blue herons, Canada geese, bald eagles, grebes and cormorants make up the bird species found on the Gulf Islands and surrounding waters. In and around this region, are over a dozen marine parks, designated for public use. Some offer small craft floats, buoys, interesting hiking trails, picnic and sanitation facilities. To protect and study the plant, mammal and bird life many places are set aside as ecological reserves. Please respect these fragile areas. Summer weather in the Gulf Island region means mornings of calm winds and seas. The afternoons can bring westerly winds and choppy conditions. It is a good idea to do your boat cruising in the mornings. Summers can be very busy in and around the Gulf Islands, so for solitude and quiet, cruise in the off-season. Anchorage is easily to find, but cooler temperatures prevail, so prepare your trip accordingly. The east coast of Vancouver Island and the Gulf Islands have many places that provide excellent boating and anchorage. Some have landing floats and mooring bays. The islands, many bays and inlets offer excellent hiking trails, picnic and even camping sites. 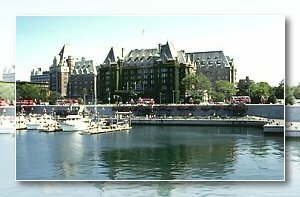 Victoria, British Columbia's Capital on Vancouver Island, has good anchorage facilities and is a wonderful and picturesque place to visit. Public floats in James Bay offer some of the best city-docking in North America. Everything boaters need is within walking distance. Stock up on marine supplies and food. Enjoy the many restaurants, gift shops, museums and restaurants. Near Victoria are interesting boating spots such as Cadboro Bay, Cordova Bay and Discovery Island. Along the east coast of Vancouver Island are many places with excellent mooring facilities such as Sidney Spit, Portland Island, Satelite Channel and Saanich Inlet. The twelve-mile long Saanich Inlet has Brentwood Bay, Butchart Cove and Todd Inlet all with over night anchorage. Cruising northward is Cowichan Bay, Maple Bay and Genoa Bay. Genoa is a good place to wait for the current to change in Sansum Narrows before heading into the Stuart Channel and Dodd Narrows. Chemainus Bay can be very congested. Telegraph Harbour offers anchorage and full services at two marinas. This is a popular stop for pleasure boats and the Thetis Island ferry has regularly runs to Chemainus. Next popular and full facility stop is the city of Nanaimo. This is a Customs port of entry with good shopping. In summer, Nanaimo Harbour is a very busy place and space can be limited. A good alternative is Mark Bay on the south side of Newcastle Island. A small passenger ferry makes hourly runs between Newcastle Island and Nanaimo. Cruising in and around the Gulf Islands is a very pleasant boating experience with many sheltered bays and inlets that have excellent floats and mooring. Saltspring Island, the largest of the Gulf Islands, is a great place to relax and enjoy the best that the islands have to offer. Enjoy cycling, riding, diving, hiking and camping. Ganges Harbour, with its galleries, restaurants, gift shops and a food market has facilities at the Government Wharf and the two marinas. This can be a very busy spot, but Walter Bay and Madrona Bay offer sheltered anchorage. Bedwell Harbour, an inlet that separates North and South Pender Islands, has needed amenities including customs dock, public floats, a resort and marinas. Beaumont Provincial Park a 32.4 hectare (80 acre) marine park has trails, camping and swimming. Between the park and the resort, are many anchorage spots. Otter Bay, on North Pender Island provides anchorage in a couple of places. The private marina at Hyashi Cove with full facilities, is becoming a popular stopping spot with locals and boating tourists. Winter Cove Marine Park, a popular boating area found on the northwestern end of Saturna Island is a 90.3 hectare (223 acre) site, with shoreline trails and tidal rapids. This is a good place to take a pleasant break and do some exploring. On the south side of Samuel Island is Irish Bay with well-sheltered anchorage. Mayne Island has many good anchorage spots such as Horton Bay, Bennett Bay, Campbell Bay and David Cove. Miners Bay is deep so anchor close to shore. Village Bay has good anchorage, but small crafts should stay clear of the BC Ferry landing. Active Pass between Mayne and Galiano Islands is a deep channel used by ferry boats, large commercial ships and pleasure crafts. Sturdies Bay on Galiano Island has a public float near the BC Ferry docks and the community offer stores, a lodge and other facilities. On the southwest side of Galiano is Montague Harbour, a very popular stopping place that is well sheltered. Montague Harbour Marine Park features a public wharf for small boats. Larger crafts should use the hooks out in the bay. This park has lovely stretches of white shell beaches, hiking trails, tidal pools, camping and road access. Pirates Cove Marine Park on the south east side of De Courcy Island is easily the most popular marine park in the Gulf Islands. In the summer, when it is very busy, a host can direct boaters to a space. Once moored, the shore trails beckon. Small crafts can use the mini floats that offer easy shore access. On shore are picnic and camping sites, and an easy hiking trail that encircles the park. The story about Brother Twelve and Madame Zee is part of Pirates Cove history. These two were leaders of a cult that thrived here in the late 1920's and early 1930's. 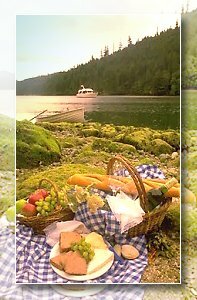 Should the boat trip take you to Gabriola Island, Degnen Bay, on the south side offers protected anchorage. Stay close to Josef Point when arriving and departing, avoiding the rocks in the middle of Gabriola Passage. A government dock offers access to the island. This section offers boaters a couple of different options and routes. One option is to stay close to Vancouver Island and explore the many coastal coves, Denman Island and Hornby Island, Nanoose Bay and Tribune Bay. Continue northward to Baynes Sound, Comox Harbour, Campbell River and the entrance to Discovery Passage. This is a very scenic route, but it offers few good anchorages. Another route to take is by Lasqueti Island. This is a fun place to explore with many small coves that feature good anchorage. The other option is to cross the Strait to Thormanby Islands and up Malaspina Strait to explore east Texada Island and the mainland coast. If planning to cross the Strait of Georgia, stay clear of the military test area. If boating and staying close to Vancouver Island, you will find good anchorage at Nanoose Bay and Schooner Cove. The marina at French Creek open year round is the only place to anchor if visiting Parksville. Hornby Island has anchorages at Tribune Bay and Shingle Spit. Comox Harbour is a busy harbour and city. It has a couple of marinas and pleasure boats use the Comox Harbour Authority floats. Lasqueti Island has good anchorage sites at Boat Cove, Old House Bay, Richardson Cove and Jenkins Cove along the south shore of the island. Located on the north side are Tucker Bay, Boho Bay, and Spanish Cove. The major settlement on the island is False Bay which has a public float or else anchor on the north shore of the bay. Squitty Bay Marine Park has a public float and dock. The entrance to the bay is narrow, so be careful and stay to the southwest side. Should you take the route across the Strait of Georgia to Malaspina Strait and Texada Island plan your trip carefully. Winds in the Strait of Georgia can be strong, best time to cross is in the morning before the afternoon northwesterlies start. The Whiskey Golf Military Test Area, just out of Nanaimo is a restricted area and must be by passed. After leaving Nanaimo Harbour head for Winchelsea Islands, pass to the east, turn east of the Ballenas Islands. Once past this point, steer northeast for Lasqueti and Texada Island and the Sunshine Coast. Discovery Passage is the main waterway that links the Strait of Georgia with Johnstone Strait. Commercial traffic, recreational boats, and sport-fishermen all use this long, narrow stretch of water between Vancouver Island and the Discovery Islands (Quadra, Sonora, and East Thurlow). Northward from Discovery Passage and Desolation Sound the shoreline and topography are rugged and steep. This is the start of the wilderness and an area that is less travelled by pleasure crafts. Careful planning and timing are needed to make this challenging excursion safe and fun. Half way through Discover Passage is Seymour Narrows, which should be navigated near slack water. Duncan and Menzies Bays, on the south, and Plumper Bay on the north side offer anchorage when waiting for slack water. Campbell River, at the south entrance of Discover Passage, is the supply centre for this region of Vancouver Island and the islands to the north. The town and district are fast becoming a tourist mecca with resorts, charters, guiding services, craft shops featuring native artifacts and northwest art, restaurants and accommodations. Quadra Island, on the east side of Discovery Passage has many anchorage sites that offer protection. They include Brown Bay, Kanish Bay, Small Inlet, Granite Bay and just off Quadra is Chained Islands with two good anchorage spots. South of Chatham Point, is Otter Cove, a good spot to hold out if Johnstone Strait is rough. This channel of 87 km (54 mi.) stretches from Chatham Point to Hanson Island, with Vancouver Island on the south and the rugged mainland coast on the north. This section can report strong winds and rough seas, but has breath taking scenery. Travel Johnstone Strait in early morning to avoid the strong winds of the afternoon. Chatham Point is an excellent place to check for choppy waters, tides and weather reports before entering Johnstone Strait. There are a few good anchorage sites on both sides of the strait, such as Turn Bay, Walkem Islands, East Bear Bight, Humpback Bay, No Name Cove and Kelsey Bay. A very popular stop for pleasure and fishing boats is Port Neville, which can be extremely busy during the summer months. Port Harvey is large and offers good anchorage. Along the coast of Vancouver Island is Robson Bight Ecological Reserve protecting orcas and their habitat. Do not chase or bother these beautiful mammals, but watch them from a distance. The region known as Eastern Queen Charlotte Strait, along the mainland offers fine boating and fishing opportunities. It has become a popular recreational area. Waters are protected with hundreds of uninhabited and secluded coves and inlets. Along the way are remote resorts with floats, telephones, power, fuel, restaurants and even pubs. Be prepared, self-sufficient, respect the wildlife and the environment. This is a remote region with little or no outside communication. Village Island, at the entrance of Knight Inlet is the deserted aboriginal settlement of Mamalilaculla. This is an interesting place to visit and see surviving remains of totem poles and long houses. Please obtain entry permission from the band office in Campbell River. Knight Inlet is 113 km (70 mi.) and the longest of the fjords along the British Columbia coast. The shores along this 3.2 km (2 mi.) wide inlet are very steep, with mountains reaching up to 2088 metres (6000 ft.). Anchorage is difficult to find in the upper section, but you can easily cruise the first part and go around Gilford Island by way of Tribune Channel. Once in Retreat Passage, there are a number of islands, islets and coves that have good fishing and anchorage spots. This includes Health Bay, Meade Bay, Waddington Bay, Shoal Harbour, Echo Bay, Laura Cove and Viner Sound just to mention a few. Kingcome Inlet with its very steep shoreline does offer some anchorage as you make your way up to Kingcome Village and Kingcome River. Greenway Sound, at the end of Carter Passage, has a floating marine resort with some amenities. 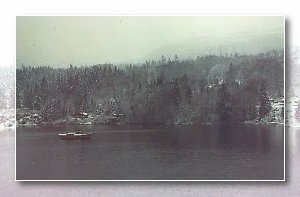 Sullivan Bay, with lodge, store and post office offers full resort facilities to pleasure boats. Continue cruising along the mainland to Lewis Cove and Blunden Harbour. Broughton Strait at the south end of Queen Charlotte Strait has mild summer weather and good boating conditions. Goletas Channel, at the northern end is where civilization gets left behind and the true north wilderness begins. Between these two the waterway is busy with pleasure boats, sportfishing and commercial fishing boats. Sea kayaking is popular here and large cruise ships also make their way through these channels. commercial and fishing boats use the floats inside the bay. On the South side of Cormorant Island is Alert Bay. Alert Bay is rich with First Nation Culture and Heritage. There are museums, art galleries, Totem Poles, Big House, gift shops, restaurants, accommodations, fishing, whale watching, etc. Be sure to visit the U'mista Cultural Centre to view the Potlatch Collection and temporary exhibits on display - call ahead for hours. For more detailed information contact the Alert Bay Info Centre (250) 974-5024. Protected Telegraph Cove is a picturesque place to visit, connected by board walks, many buildings are on pilings. This is the launching place to Robson Bight and whale watching. The village of Sointula on Malcolm Island is a favourite stopping spot with its colourful painted buildings that include a food store, marine hardware store, and postal service. Stock up on fresh water, gasoline and diesel fuel. Port McNeill with three public floats is a busy place. Everything boaters need is within walking distance of the boat harbour. This makes it a favourite supply spot with boaters. Cruising north, is anchorage at Beaver Harbour, Cattle Islands, and Patrician Cove. The northernmost small city on Vancouver Island is Port Hardy with public float, a large wharf and easy access to shopping and needed facilities. Nearby Bear Cove is the terminus for the ferry to and from Prince Rupert. When reaching Port Hardy, it is decision time. The options are, turn around and go back south. Head north and the inside passage, or go around Cape Scott and the west coast of Vancouver Island. If planning to cruise around Cape Scott, be well prepared and plan the trip very carefully. Goletas Channel, offers a few good anchorage sites on the small islands between Queen Charlotte Strait and Queen Charlotte Sound. Before sailing Nahwitti Bar, Bull Harbour on Hope Island offers secure and protected anchorage. Nahwitti Bar can be a dangerous place for small crafts, cross only when the winds and water are calm. Cross at high water slack. When possible follow a local fishing boat. Close all port lights and stow the dinghy on deck, towing it is not advisable. After crossing Nahwitti Bar and before cruising around Cape Scott, take time out to explore the shoreline of Cape Scott Provincial Park. Boating the north end of Vancouver Island to the west coast of the Island is not for the faint of heart. Cape Scott is notorious for winds, unpredictable current, dangerous rocks and no place for shelter. The light house, is a welcome sight. Once the light house is abeam, the worst part of your excursion is over. The waters in this region are very productive. Many commercial fish boats are in the area and you are never alone. This part of Vancouver Island is remote, rugged, beautiful and mostly uninhabited. Cruising here is an experience you will never forget. Heading south, there is anchorage at Hansen Bay. Explore this historic site. Sea Otter Cove, 11 km. (7 mi.) south of Cape Scott, although undeveloped, offers public buoys for small to medium sized boats. In the summer during good weather, San Josef Bay has three anchorage sites. They are Hanna Point Bight, San Josef Inner Bay North and South Sides. Quatsino Sound is the first of the major sounds on the West Coast. It offers protected anchorage, access to a road system and supply centres. Winter Harbour is a welcome spot with two pay phones and a well stock store. Including frozen and canned goods, bakery items, fresh produce, a liquor outlet, hardware and fishing supplies. Inner Quatsino Sound, leads to places like Holberg, Coal Harbour and Port Alice. All three places have road links to Highway 19 (Island Highway). Within the Sound are many good anchorage sites and it presents interesting boating as you make your way up and down the four different arms of this waterway. The outer section of Quatsino Sound offers places with anchorage and protection. They include Grant Bay, Nordstrom Cove, Mabbott Island, Harvey Cove, and Gooding Cove. Crossing Brooks Bay and getting around Brooks Peninsula can be quite a challenge. Within Brooks Bay are Klaskino Inlet and Klaskish Narrows, both are narrow and deep with no known anchorage sites. Klaskino Anchorage on Anchorage Island is sheltered with public mooring buoys and McDougal Island has Klaskish Anchorage. At the head of Klaskish, is the gorge entrance to Klaskish Basin, a very serene, unusual spot with public mooring buoys. This is a pleasant place to rest, to explore and to see wildlife. Jutting out from Vancouver Island is Brooks Peninsula, a forbidding and battered stretch of land that separates the cold northern water from the warmer southern waters. Winds and water from the north and south seems to meet at Cape Cook and Solander Island. It can be a trying place for cruisers. Clerke Point the south end of Brooks Peninsula is where the waters and weather start improving. When cruising Checleset Bay the difference is noticeable. Make your way into Nasparti Inlet and calmer waters. Columbia Cove and Baidarka Cove both offer anchorage. To sail from Nasparti Inlet to Ououkinsh Inlet, you must get by rocks, reefs and islets, so plan your route carefully. Continue south by either going out into ocean water or make your way through the Bunsby Islands by way of Gay Passage. From this point, stay close to the coastline making your way to Walters Cove and Kyoquot Sound. The entrance to Walters Cove is tricky and following a local boat into the cove is best. This little settlement has a store and restaurant. Boaters can stock up on water, fuel and groceries. Anchor at the public wharf. In and around Kyoquot Sound are many interested places where boats can anchor. The best and safest way into the Sound is by way of Kyoquot Channel, not Crowther Channel. An excellent and favourite anchorage spot with sea kayakers, sports fishing boats and cruise boats is Kyoquot Bay on Union Island. Other good places for anchorage within the Sound are at Surprise Island, Hankin Cove, Hair Harbour, Rugged Point and Dixie Cove. On leaving Kyoquot Sound, take Clear Passage to Tatchur Point and beyond. To explore in and around Nootka Island, enter Esperanza Inlet by way of Gillam Channel, Tahsis Narrows to Tahsis Inlet and Friendly Cove. This is a longer scenic route with excellent anchorage sites. The first protected anchor spot in Esperanza Inlet is Rolling Roadstead. A popular stop over is Queen Cove in Port Eliza. It offers protection and scenery, a great combination. On the south side of the inlet, Garden Point Bight has good anchorage facilities. Logging and other commercial ventures keep the village of Zeballos afloat. The village is at the very end of Zeballos Inlet and has a public wharf with public floats. It also has supplies and communication. The Nootka Mission operates home base from Esperanza, on the north side of Hecate Channel. This centre, offers environmental education and operates as a spiritual retreat. Friendly staff members are always willing to share the history and other interesting facts about this area. Tahsis with a large logging mill at the head of a deep fjord offers boating supplies and services. Tahsis Inlet is narrow, long and can be choppy. Nootka Sound offers a number of protected and interesting anchorage spots. There is Friendly Cove, which belongs to the Mowachaht Band. Please obtain permission before entering or crossing. Santa Gertrudis Cove offers shelter for small crafts. Nootka is a sport fishing resort. Jewett Cove on Strange Island has anchorage for small boats. 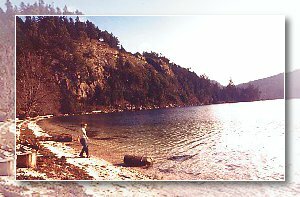 Tlupana Inlet, a deep fiord offers protection in Critter Cove, Valdes Bay, and Galiano Bay just to mention a few. At the head of Muchalat Inlet is Gold River, a pulp mill town with facilities and anchorage at the public wharf. Resolution Cove, is the spot where Captain Cook refit his ship, the Resolution, with a new mast. Estevan Point can be rough going, but once around the point, sheltered Hesquiat Harbour, has anchorage. From this point on, the waters are much busier and signs of civilization are everywhere. A very popular spot with everyone, including locals is Hot Springs Cove, an outdoor hot spring. During the summer, Hot Springs Cove is a very busy destination spot and the public float can be crowded, but there are public mooring buoys. Other sheltered anchorage spots in Sydney Inlet, are Hoot-la-Kootla, Baseball Bay, Riley Cove, Young Bay and Bottleneck Cove. This area makes for great cruising with its inlets and passages that make their way by Flores, Vargas and Meares Islands. Good anchorage sites are found along the inside passage. Shelter Inlet offers protection at Steamer Cove and Bachante Bay. Matilda Inlet on Flores Island is sheltered and has good anchorage. If supplies are needed, Ahousat on the west side of the inlet has fuel, water and a store. The Clark's who own and operate the Ahousat General Store are always willing to talk about the local history, where good cruising and anchorage sites are available. Tofino is a major centre on the West Coast of Vancouver Island and is a bustling, busy town, with resorts, gift shops and restaurants. It also serves as a supply centre for Clayoquot Sound. Tofino offers anchorage possibilities including the public wharf. A paved highway connects the town of Tofino to Port Alberni and the rest of Vancouver Island. Pacific Rim National Park starts just south of town and stretches along the coast to Port Renfrew. Long Beach does not have any mooring spots but is a great place to explore on foot. This is the most popular recreation Sound on Vancouver Island. Both Ucluelet and Port Alberni in the Sound offer connections to the Island's main highway system. Lady Rose, provides a ferry service up and down the coast and into Alberni Inlet regularly. The Lady Rose makes stops at the resorts and commercial operations as it travels between Ucluelet, the Broken Group, Bamfield and Port Alberni. Barkley Sound is exciting to explore. Find anchorage and do the looking from a dinghy. Take time to explore the Pinkerton Islands, Stopper Islands, Pipestem Inlet, Effingham Inlet, the Chain Group, the Deer Group and the Broken Group. Ucluelet Inlet at the northwest entrance to Barkley Sound has a couple of public floats, wharfs and buoys that all offer good anchorage. The village of Ucluelet can be very busy during the summer with pleasure boats and commercial fishing boats. It is a good place to stock up on needed supplies. Sea kayakers, canoeists and cruising boats use the Broken Group, which is part of the Pacific Rim National Park. The waters are protected and the islands offer historic value and good cruising. Camp only in designated spots, pack out all your garbage, do not remove any artifacts, and wildlife is protected. Effingham Bay, the most popular anchorage has room and offers good anchorage. Other anchorage spots are at Nettle Island, Jarvis Lagoon, Island Harbour, Dempster Island, Turret Island, Clarke Island and Benson Island. Alberni Inlet, is deep and cuts into Vancouver Island some 64 km (40 mi.). Port Alberni at the head of the inlet offers full services and has marinas for small crafts. The inlet is narrow and steep. Bamfield Inlet, on the other hand is open and accessible. The village of Bamfield is on both sides of the inlet, and 'main street' is the inlet. When anchored at Bamfield stock up on marine supplies, fresh produce, meats and other items. Also take time to visit the Bamfield Marine Research Station, run by British Columbia and Alberta universities. The West Coast Trail, part of the Pacific Rim National Park, stretches from Bamfield to Port Renfrew. Hikers can either start or end their trek here. Cape Beale at the eastern entrance to Barkley Sound should be sailed in the morning before the westerly winds start. Once around Cape Bale, head in a more easterly direction making your way past Carmanah Point and the northern entrance of Juan de Fuca Strait. This stretch of water can quickly change, so be prepared. Start the trip from Barkley Sound to Victoria early in the morning, making your way around Carmanah Point before the prevailing winds start. Pachena Bay, Seabird Rocks and Pachena Point do not offer good mooring. Nitinat Lake, is a freshwater lake that goes directly into the ocean and the surging waters make this entrance very dangerous. Port San Juan offers protection and anchorage possibilities. Thrasher Cove, Snuggery Cove, Port Renfrew and Woods Nose have mooring positions. The next anchorage site in Juan de Fuca Strait is in Sooke Inlet with both Sooke Harbour and Sooke Basin. Becher Bay can be full with sport fishing boats, but Campbell Cove offers easy access and protection. Make your way around Race Rocks, through Race Passage and into Victoria. The warm waters and weather are now behind. Boats are fewer and services are sparse. Make sure you have plenty of fresh water and necessary supplies. Disposing of garbage can be a problem. This sheltered inside route is used by north bound sailors who wish to avoid the hectic Johnstone Strait. Using this inside waterway means running Yuculta Rapids, Dent Rapids, Greene Point Rapids and Whirlpool Rapids. This will take careful planning. Know the times of slack water at each rapid and how long it will take to get to each rapid. Make sure you have the necessary up-to-date charts. This route goes into Cordero Channel, Chancellor Channel, Welbore Channel and finally Sunderland Channel and into Johnstone Strait. Along the way are a few well-protected spots where you can anchor such as Big Bay on Stuart Island, Thurston Bay, Cameleon Harbour and Handfield Bay in Nodales Channel. Other mooring sites are at Shoal Bay, Bickley Bay, Cordero Lodge, Blind Channel Resort, and Forward Harbour. If Sunderland Channel is rough, Johnstone Strait will be worse. Wait out the nasty conditions in Forward Harbour. Johnstone Strait is a scenic passage and with good planning, the trip can be very enjoyable. The Inside Passage boat trip must be done with care and great planning. This is not an excursion you should take lightly. Make sure the boat is seaworthy and carry as many spare parts as possible. Both fuel and water can be a bit difficult to find, always carry plenty of both, and stock up whenever possible. Carry a good supply of charts and reference books. They will be needed. Weather in this region can change quickly, bring clothing for all seasons. Be self reliant and prepared to sit out a storm or fog when necessary. The Inside Passage is a spectacular and busy waterway, used by fishing boats, large cruise ships and small pleasure crafts, always be prepared for the unexpected. The most hazardous part of the Inside Passage journey and the largest section of open water is Queen Charlotte Sound. There are three different routes to take, inorder to cross this Sound. The main route, although longer, offers better scenery and is a very exciting trip. An early start from either God's Pocket or the Walker Group Cove is necessary, head out before the winds start and the water gets rough. On the way to Cape Caution there is protected shelter in Shelter Bay North, Southgate Island, Goose Point Cove in Schooner Channel, Nugent Sound and Miles Inlet. Continuing north by way of the main route after Cape Caution, there is good anchorage at Egg Island.The Island has a light house, radio beacon, emergency light and a heliport. Also, the lighthouse keepers are very helpful. Jones Cove, Takush Harbour and Millbrook Cove at the entrance of Smith Sound offer protection and anchorage. Cruising by Rivers Inlet, find temporary shelter at Open Bight. Anchor at Home Bay, but this is a very busy resort, so West Home Bay that is uninhabited with good shelter is a better anchor site. Make anchorage at Taylor Bay, and with a kayak or dinghy do some exploring at the entrance of Rivers Inlet. On the southwest side of Penrose Island, find anchorage spots in a place called Schooner Retreat.